Thinking of visiting a hair salon spa? For those uninitiated into the relaxing world of hair salons and hair spas, take a peek into what you must look for in a hair salon and spa. All of us suffer bad hair days; days when the hair refuses to stay in place or rather refuses to stay we want it to. Be it a special occasion or just an excuse to pamper yourself, a trip to the right hair salon and spa and use of suitable services and products is sure to leave your hair bouncy and healthy. Look for referrals from friends or colleagues. After all your hair deserves the right treatment! But at the end of the day, cultivate your own hair salon and stylist. After all, what works well with Amandaâ€™s crop of curls may not work that well on your long tresses. Choosing a hair stylist is a very personal thing â€“ someone who works in harmony with what you are looking for! The essence of a good hair salon and stylist is to be able to communicate well. Check with the hair professionals to find out what kind of treatment your hair needs, be it deep conditioning or coloring services, hair texture management or hair styling. Cleanliness â€“ the basic requisite of any hair salon and spa. Donâ€™t compromise on the hygiene levels, clean work stations and equipment used. Look for salon services that cater to your ethnicity. Women with different racial backgrounds will have differing needs and products more suited for their hair type. It is not wrong to call up a hair salon and spa and check out rates for various services. You can go in for a hair specialty salon and get your tresses attended to. Alternatively you can visit a body spa and partake of other beauty services such as a relaxing pedicure or a reviving facial. A hair routine that has me totally hooked is a warm oil hair massage. The massage does wonders not just for my hair but for the rest of me too. I love surrendering my mane to the hands of the hair salon expert who weaves her magic into about 20 minutes of hair massage with warm oil. With the slow sure touch on the scalp, you can feel your stresses slowly ebb away. The hair massage usually extends to the neck and upper back. To feel the warm oil seeping into the scalp, the pressure on the hairline and at the nape of the neck and the gentle pull on the hair roots lulls me into a peaceful state. Choosing the oil for hair massage is based on individual choice, from the heavier almond or olive oil to herb-infused coconut oil. For ages, warm oil has been used in India for massaging the hair and body. Hair oil is infused with herbs and hibiscus flowers to promote healthy hair. If you do not have the time for a leisurely hair massage at the salon, why not try one yourself at home. Doesnâ€™t promise to be the real thing but nevertheless it sure does good! Take some oil in a bowl and place it in a pan of hot water. When it is comfortably warm to the touch, you can apply the oil to different areas of your scalp with a small wad of cotton. Part your hair so as to work it into all parts of the scalp. Then work it in with the fingers using slow circular movements. Continue this for a few minutes or as long as you can manage it without your arms screaming for help. Dip a towel in hot water, wring it out and wrap it round your head. Faster hair growth – Tips on enhancing hair growth. Damaged hair care – Managing damaged Hair. It was just the other day that my friend Rhea called me over to look over and help her try out her new buy â€“ a thermal hair straightener. With hair straightening taking women all over by storm, it wasnâ€™t surprising that I took on her invitation right away. The hair straightener looked like a pair of flat tongs, each having a heating element within. The manual said that all you had to do was place your hair between the heated tongs and pull along till the end of the hair shaftâ€¦and voila! You should have ramrod straight locks! Both of us had done our homework and read tons of material on temporary hair straighteners. My friend was forever lamenting that she didnâ€™t like the look of her curly hair. Not wanting to subject her hair to chemical straightening treatments, it was decided that the hair straightener was the next best bet. So she was itching to get her hands on the hair straightener in the fond hope that it would lend the straight silky locks that she so desired. The ceramic hair straightener offered the user the ability to control heat settings. Combining electrical, mechanical and thermal forces, this contraption offered to smoothen frizzy locks. The heat from the hair straightening iron causes temporary restructure of hair, thereby flattening it. The force applied by the tongs squeezes and realigns cuticles of the hair shaft so as to make it appear smooth and straight. Applying hair moisturizer before using the hair straightener was good piece of advice. This prevented Rheaâ€™s hair from turning excessively dry. It is not wise to use a hair straightener everyday, as the hair needs some time to recover from being subject to heat settings. It is essential to follow up regular hair straightening with deep conditioning so that the shine and bounce is maintained and flyaway hair is kept at bay. Do not use a hair straightener on wet hair for fear of singeing it. 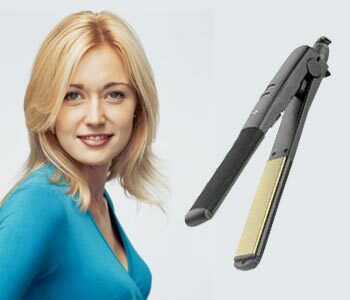 What I have noticed is that hair straighteners tend to work best on those who have wavy hair. Extremely curly locks tend to get straightened but end up looking like coiled springs, ready to spring back to original condition. This often lends an unnatural appearance and the hair lacks natural bounce. So do we stick to the adage that its best to make the most of what nature has given us? 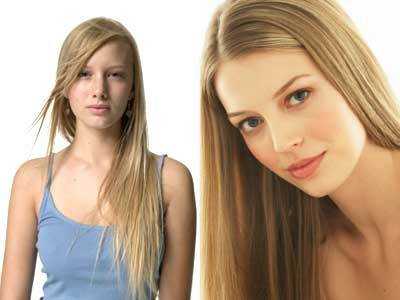 Hair Straightening – Detailed article on hair straightening.